Max Scherzer had to leave his final start of the regular season in the fourth inning last night when he pulled up lame after throwing a pitch. Nationals manager Dusty Baker tried to play it off like it was no big deal, but the Nationals are less than a week away from a playoff series. It’s kind of a big deal, Dusty! Scherzer did not speak to reporters after the game, the first time in his Nationals career he has not been available postgame. 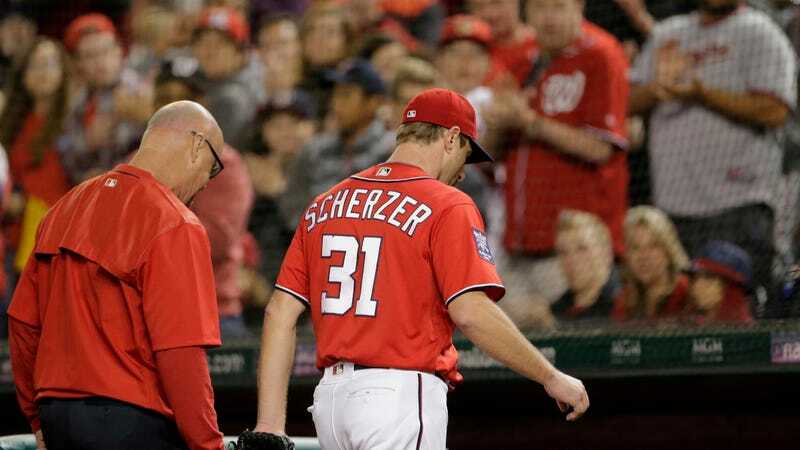 He had left Nationals Park to get what the team called a precautionary MRI on his right hamstring, something that does cast doubt on Baker’s optimistic prognosis, but is not necessarily surprising given Scherzer’s importance to this team and its cautious approach to injuries. Disaster! Quietly, Washington’s starting pitching hasn’t been real great over the last few weeks of the regular season. Stephen Strasburg has been fantastic, allowing just five earned runs over his last nine starts, and Max Scherzer has been fine, but Gio Gonzalez has amassed a 4.47 ERA over his last six starts, and Edwin Jackson has been horrific. Since his final August start, Jackson has allowed 24 runs in 26 innings over five starts, a bad enough run that it would surprise no one if he found himself without a roster spot in the playoffs. And Tanner Roark has had a rough, up-and-down season from start to finish, and his career-worst 4.59 ERA and 1.320 WHIP do not inspire a ton of confidence, should he take the mound at any point in the post-season. 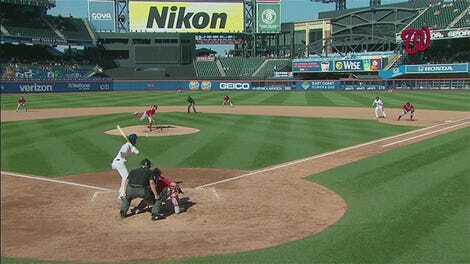 But most painfully, the Nationals are just now starting to get healthy. Jayson Werth and Bryce Harper are finally back in action after missing huge chunks of the season due to injury; Trea Turner has only been back a couple weeks; Harper still hasn’t played a full game since mid-August. The Nationals have had a successful regular season, but past playoff failures have put them in a position where another sparkling regular season followed by another flameout in the NLDS will not, in fact, be viewed as any kind of success at all. In fact, it will be viewed as a heartbreaking failure, by me. Which makes this Max Scherzer news just friggin’ wonderful. There’s nothing quite like a team’s ace pitcher needing an MRI after his final start, less than a week from the opening of an NLDS series against the defending World Series champions, to really boost optimism of an extended playoff run. Back in June Cubs executive Todd Ricketts told Donald Trump the Nationals would “crumble” in the playoffs. I for one would appreciate them at least waiting that long.